In a major tax cheer to the middle class, the Interim Budget has a provision for income tax rebate for the middle class declaring taxable income up to ₹ 5 lakhs. The current tax regime makes income tax rebate for taxable income declared of only up to ₹2.5 lakhs. However, the income tax slabs beyond the ₹5 lakh mark will stay the same. Individuals with an income up to ₹6.5 lakhs making investments in specified saving programs, such as Provident Funds will also get the benefit of the full exemption. Futher, the government has also provided for a rebate on the Income Tax to be paid on notional rent, levied on the owner of a second residential space – whether the second space was generating income or not. The government announced to increase the threshold for TDS on interest generated from savings with post-offices and banks from ₹10,000 to ₹40,000, likely to benefit small middle-case savers, especially senior citizens. The TDS threshold exemption on rent increased from ₹1,80,000 to ₹2,40,000. Capital rollover gain of up ₹2 crore has been extended to 2 houses from 1 house, and can be availed of once in a lifetime. On a similar note, Income Tax on notional rent for real estate companies is to be exempted for 2 years from the current one year. In the current year, the government has announced that it receives ₹97,100 crores in proceeds from the GST per month. In January 2019, the government expects this figure to touch ₹1 lakh crore. The government guarantees states tax growth of 14%, which will be underwritten by the central government. Should a state have a GST shortfall, the deficit will be met by the Centre. 36 capital goods have no duties imposed upon them. The Budget laid out a direct benefit transfer under a new program called ‘Pradhan Mantri Kisan Samman Nidhi to ‘vulnerable’ farmers – or to those who own less than 2 hectares of land. The direct benefit transfer would be to the tune of ₹6,000 annually, which would be paid in 3 equal installments of ₹2,000 each. The government announced this scheme with retrospective effect since 1st of December 2018. This is estimated to benefit 12 crore farmers. The government has an outlay of ₹75,000 crores for this scheme. 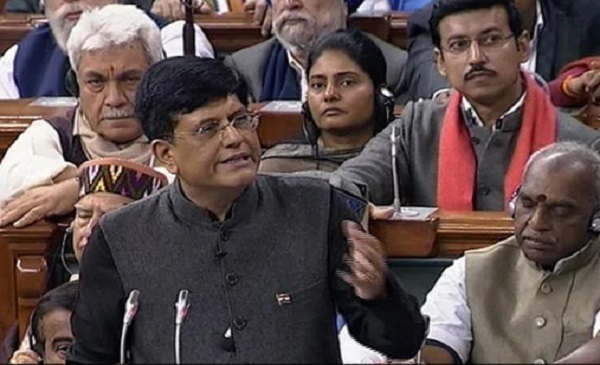 Goyal stated that 50% of India’s GDP is generated through the unorganised sector. In an attempt to provide a layer of security to them, the government has announced a major pension scheme for them which is expected to benefit 10 crore workers. The scheme assures a pension of ₹3000 per month those individuals attaining the age of 60, available at ₹100 per month to a worker. Those who join the scheme at the age of 18 need only pay ₹55 a month. The government will match the contribution paid by a worker into the fund. The government to pay ₹500 crore towards this scheme in FY20. Additionally, there will be ₹60,000 crore allocation towards MNREGA. In a organisational rejig, the government has proposed the introduction of a Ministry of the Fisheries. The government has decided to extend Kisan Credit Cards, initially available to those only engaged in agriculture, to those engaging in animal husbandry and fishing. There will be a new scheme for the preservation and the welfare of cows under the ‘National Gokul Mission’ and there is a provision of ₹750 crores towards it. Interest subvention of 2% to those pursuing animal husbandary. In case of a natural disaster, there would a 2% interest subvention for the rescheduled payment given to farmers and a further subvention of 3% on timely payment. The government has missed its fiscal deficit target of 3.3% of GDP and has revised its estimate at 3.4% of GDP, and they aim to reach a fiscal deficit of 3% by 2020-2021. The Current Account Deficit is seen at 2.5% of GDP. The economy is worth $3.6 trillion, and is expected to reach $5 trillion in the next 5 years and $10 billion in the next 10 years. The government has expenditure outlay of the ₹28,84,200 crores, up 13.3% over last year. The government received ₹1 lakh crore from PSU disinvestments, and estimates to touch ₹80,000 crores this year. The government also aims to get the debt to GDP ratio down to 40% by 2024 – 2025. In case you need a primer, BOOM has written on these concepts earlier here. The government has laid out its highest ever defense budget at ₹3 lakh crores for FY20. The government has sanctioned ₹1,15,658 crores as total expenditure towards the railways. A National Centre for Artificial Intelligence (AI) and a national portal for AI. Single window clearance for shooting films, which was only extended to foreigners, to be now extended to Indians. One lakh digital villages in the next five years. 22nd AIIMS to be opened in Haryana. Space explorations – putting an astronaut in space by 2022. Minimum government and maximum governance through an efficiant bureaucracy. Note: The story has been updated with some change in terminology. The government offers a rebate and not an exemption. Over and above taxable income of ₹5 lakhs, the old slabs are still applicable.